Today I feel wonderful! Today, we finally managed to finish the second area in our Big Backyard Makeover right before the summer kicked in full-force. But the rest of the areas will have to wait until early Fall, as they involve a lot of transplanting. Besides, Connecticut summers are perfect for paint projects, so I don’t want to miss the great weather for all the makeovers I have to tackle. 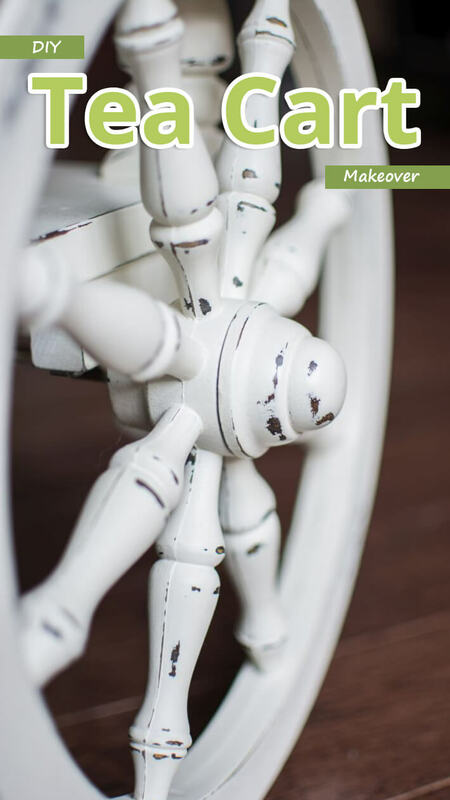 DIY – Tea Cart Makeover! 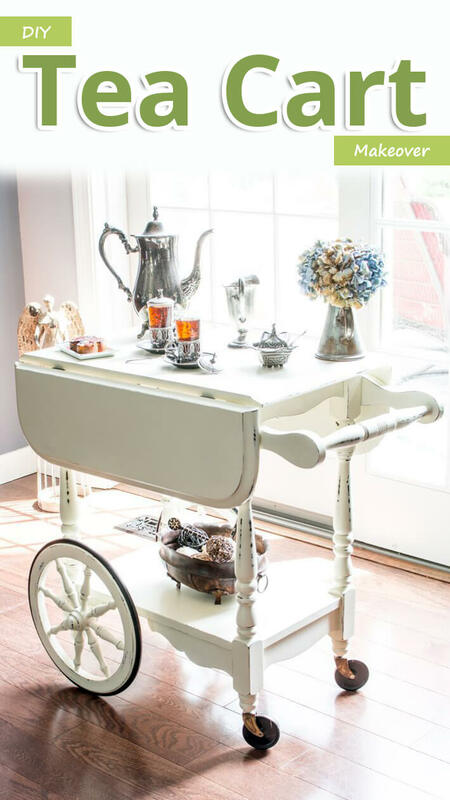 You may remember this little tea cart from some pictures in my previous posts. We bought it two years ago at a tag sale for $20. It was in pretty good condition, with only a few scratches on the top. But it wasn’t anything special, made from just a cheap plywood and veneer, hence the bargain price. As it wasn’t made from real wood, instead of giving it to Greg as a project, I decided to paint it. To do so, first I took it all apart and cleaned each piece with a damp cheesecloth. Next I prepared my homemade chalk paint in Old White. I normally use the recipe below to prepare my homemade chalk paint. But that is for brush painting and it is a little too thick to use with a paint sprayer. Since I will be spraying a lot this summer, I had to modify that recipe to make it work with my Wagner Paint Sprayer. Below is the pinnable image of the recipe, if you’d like to pin it for future reference. After preparing my homemade chalk paint, I started prepping my spray paint area and filled my Wagner with paint. I have to say this little machine was the best gift Greg ever gave me! It is such a time saver! …and gave the entire thing 3 thin coats of paint. With my Wagner, it took no time at all! Next, I gave every piece a slight sanding with 320 grit sandpaper. That was so I would have a perfectly smooth surface all over. While I was at it, I also distressed a little. Once the sanding was done, I vacuumed the dust off of every piece and once again wiped the all the pieces with a damp cheesecloth. After getting every piece nice and dust free, I started waxing them with Annie Sloan’s clear wax. …then I wipe the excess with a cheesecloth and buff it a little. Since I buff everything with an electric buffer at the end of the project, I don’t spend too much time to make it shine while waxing. After I finished waxing, I grabbed my $5 tag sale buffer and buffed all the parts. Next, it was time to reassemble the cart. 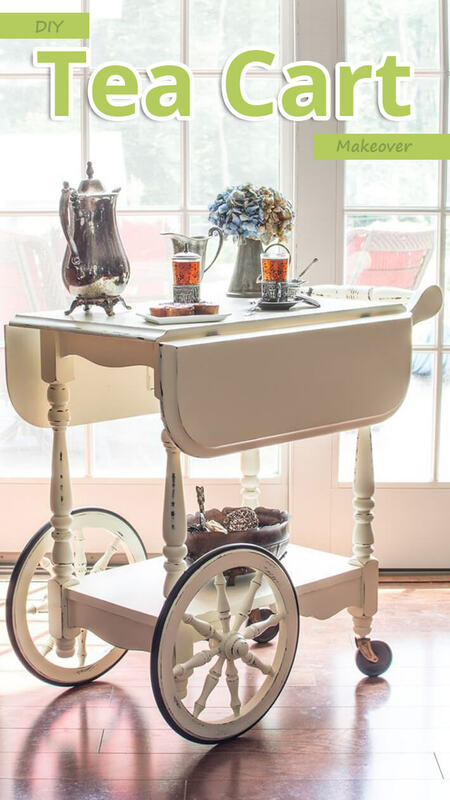 And here is our finished tea cart! Although along the way I was contemplating whether to put stencils on it or not, in the end I decided not to. I am so glad I didn’t, because sometimes just simple one-color paint and a little bit of distressing is more than enough to give that refreshed look I love. And here is my favorite picture of this pretty lady! As usual some close-ups to show you the details and the finish a bit better.